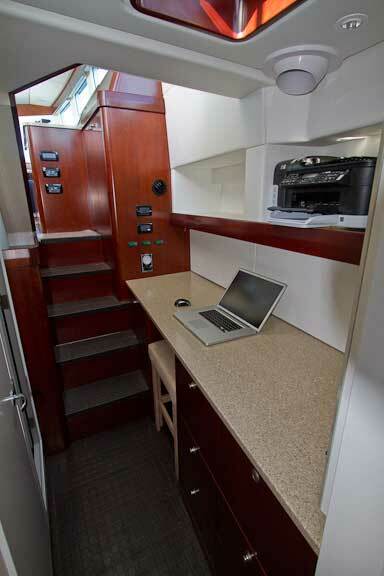 One of the design goals for the FPB 64 was a space that would function as an office. 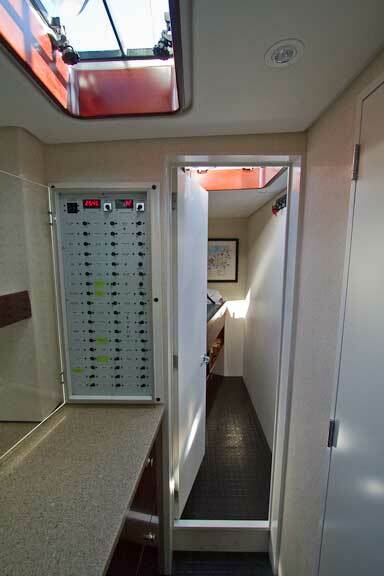 Having just spent the last 24 hours cruising aboard Avatar and using this space we can tell you it works really well. The clear story affect from the windows above the stairs leading to this area is lovely. The combination of natural and halogen lighting makes this a good spot for working on the computer. 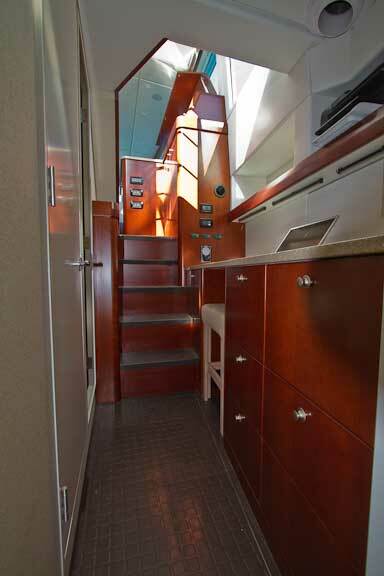 There is also light and ventilation from a deck hatch. 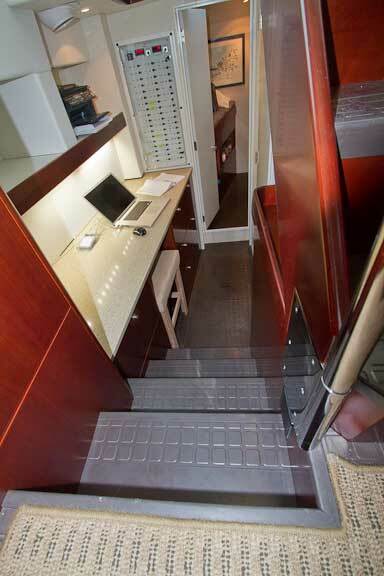 Leaving the door to the aft cabin open increases the feeling of spaciousness. 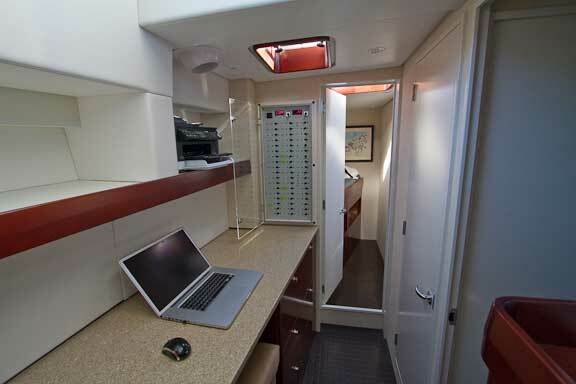 Our guess is that the aft starboard cabin will frequently end up as an adjunct to the office – we’d use it for camera gear. Th shelf above will work with printers and scanners, and three ring binders with ship’s manuals. Six drawers adorn the front of the desk. This entry was posted on Friday, April 2nd, 2010 at 3:56 pm and is filed under FPB 64 Updates. Both comments and pings are currently closed. 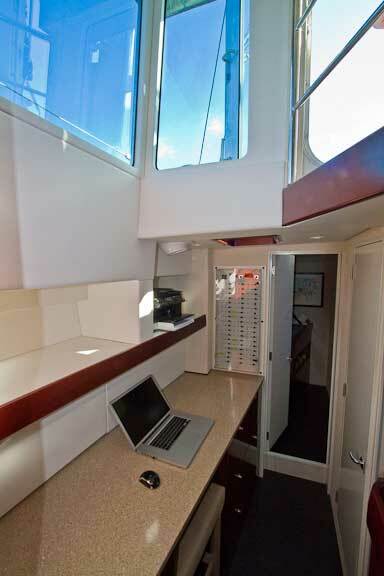 Great office with great light (in a great yacht)! But I can’t see any sockets? PCs, (Macs as well) screens, discs, printers, and so on, accumulate a great demand for sockets. But I can’t see any? 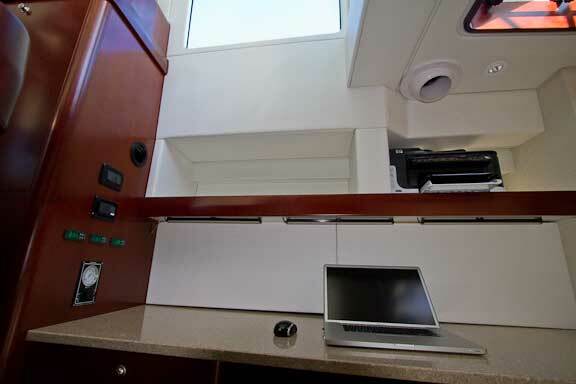 Power points are behind the hull panel just above the desk. This is done so we don’t have a lot of messy cables in view.